The idea came when we decided we wanted our little one to be a tiger and we wanted a coordinating costume for mom. 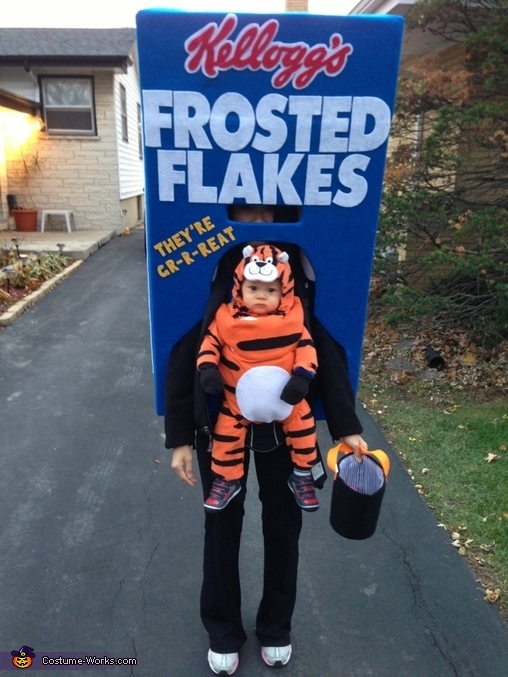 Thus we came up with Tony the Tiger as part of a Frosted Flakes box. Mom carried the baby in the baby carrier, and decorated the front of the carrier to look like a tiger (made of felt). Then I took a big 40" flat panel TV box and cut out some spots where Tony the Tiger was and where mom needed to get into the box and a cutout for mom's eyes to see out of. The rest of the costume (letters, nutrition facts, etc.) were all felt. Overall cost was only the cost of felt material, which was about $15, and the cost of the tiger costume for baby, which was $20. Dawn - I just freehand sketched the work "Kelloggs" on red felt, and cut it out. No fancy trick or anything. Good luck! How did you get the costume to sit on you? What's holding it up?? Renee - It is sitting on my shoulders. I glued foam inside the box (you can see what the white foam peaking through). Try to use as lightweight foam as you can so it's not too heavy.